When mature this Asian species forms a large tree with a spreading canopy and dark fibrous bark, the leaves to 30 cm long are bipinnate. Flowers are cream to pale yellow in fluffy clusters, peduncle to 5 cm long, the numerous stamens are about 2 cm long. 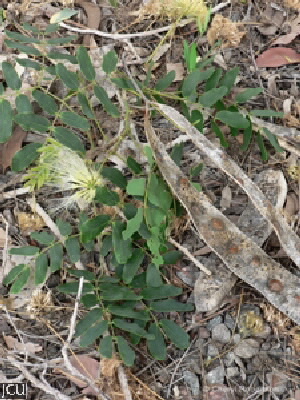 The flat, thin, light brown pods rattle in the wind when they brush together are 19-28 cm long and 3-5.5 cm wide. Flowering summer. This tree is not strongly wind resistant.